"She has more energy than anyone I know of." --John Glenn, astronaut, referring to Chiaki Mukai when speaking at a press conference in 1999. Praised and loved both by the Japanese government and people, Chiaki Mukai has blazed new trails into a field previously unheard of for women. She has become an incredible success in her field as Japan’s first female astronaut, and yet another source of pride for Japanese people worldwide. Chiaki, who has received a plethora of awards for her work as an astronaut, began in a seemingly unrelated field. Born in Tatebayashi, in the Gunma Prefecture on May 6th, 1952, she moved to Toyko for school and eventually studied medicine at Keio University. She received her doctorate degree in medicine in 1977 and, after two residencies, returned to school to specialize in cardiovascular surgery. Later, she would return to receive her degree in physiology. At Keio University, she met her husband, a fellow doctor by the name of Mukai Makio, and they married in 1982. Soon after, she achieved success both as a chief resident and as a professor of cardiovascular surgery. It was this very success that brought her recognition and, consequently, a nomination for the National Space Development Agency of Japan (NASDA) to serve as a payload specialist for the International Micro Gravity Laboratory on board the Space Shuttle Columbia. 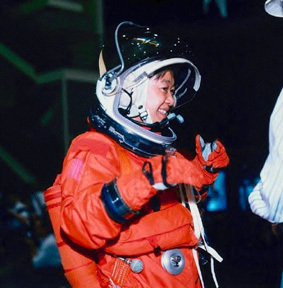 Thrilled by the nomination, and even more so at being selected as one of three Japanese Payload Specialist candidates for the First Material Processing Test, Chiaki traveled to the NASA Johnson Space Center in Texas in 1987 to begin training. Her first flight came in July of 1994, making her the first female Japanese astronaut. A true physician and scientist at heart, Chiaki eagerly participated in several physiological experiments in zero gravity. The mission was designated, among other things, as an extended duration orbit mission focusing on medical experiments related to the cardiovascular system, the autonomic nerve system, and bone and muscle metabolism. 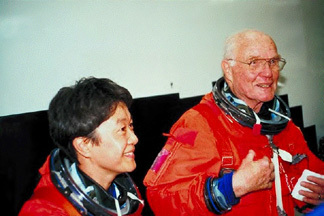 In 1998, she flew on board the Discovery with John Glenn, the oldest living astronaut. He was impressed by her boundless energy, later commenting on it in a press conference, and the two developed a friendly rapport. 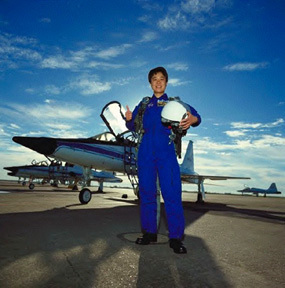 Chiaki is not only the first female astronaut from Japan, but also the first Japanese astronaut to fly twice. 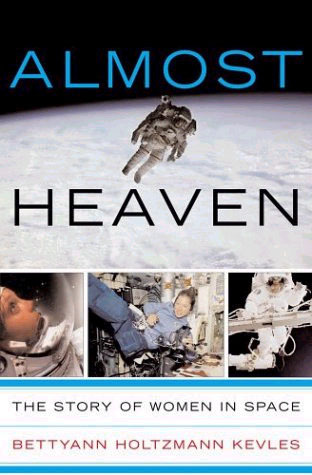 In other words, she broke both male and female boundaries, all in all logging in over 566 hours in space. Chiaki’s energy exudes in her amazing work ethic and her busy schedule. She currently remains a visiting professor at Keio University Hospital, though she is based at the Johnson Space Center in the United States. She is also a Research Instructor at the Department of Surgery of Baylor College of Medicine in Houston, Texas. Her boundless energy is evident in her overabundance of physical hobbies as well, which include Alpine competitive skiing, bass fishing, tennis, golf and scuba diving. Chiaki is also known for her writing, being credited with approximately sixty publications since 1979. Knowing well that the general public is not yet fully aware of the extent of benefits which space exploration has to offer, Chiaki makes it a point to bring astronauts a bit ‘closer to home’ to the Japanese people. She always keeps the public in mind, and encourages them to participate in other ways. Recently, she created a national competition to have the Japanese public finish a traditional “tanka” poem of which she had written the first three lines. The subject: weightlessness. Later, she brought together the children of Japan to help her find a name for her toy teddy bear. It is simple, yet powerful actions like these which set Chiaki apart from the “average” success story. Evidently, she remains close to Japan at heart and has remained humble despite her grand achievements. 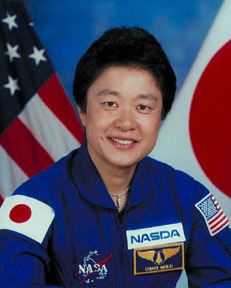 The Japanese government has stated that it considers her a “triumph of determination, perseverance, and hard work.” Among an array of awards, Chiaki has received: the “Outstanding Service Award” by the Society of Japanese Women Scientists (1996), “Special Congressional Recognition” by the U.S. Congress (1995), the “Prime Minister’s Special Citation for Contributions to Gender Equality” (1995), the “Minister of State for Science and Technology’s Commendation” (1994 & 1992), the “Outstanding Service Award” by the National Space Development Agency of Japan (1994 & 1992), and the “Award for Distinguished Accomplishments” by the Tokyo Women’s Foundation (1994). Chiaki Mukai is honored both because of the amazing accomplishments she has garnered for her field and country, but also for what she has done for the advancement of womankind. National Space Development Agency of Japan (NASDA) - links to many articles about Chiaki.